Varicose veins are twisted, ropelike blood vessels that run just beneath the surface of the legs. Half of all women and about one-quarter of men develop varicose veins to some degree as they grow older. Varicose veins develop because of the failure of a series of small, one-way valves in the veins. As the heart pumps, the valves open to let blood through and then shut to prevent it from being pulled by gravity back down to the feet. If one of these valves malfunctions, blood leaks through it and pools above the valve below it. This causes the vein above the lower valve to bulge. The vein can become so large that it is visible through the surface of the skin. A leg in which there are many varicose veins also becomes somewhat swollen because fluid from the blood in the bulging veins starts to leak into the tissues around the veins. In women, a common cause of varicose veins is pregnancy. The weight and size of the fetus presses on the veins in the pelvis, increasing the pressure in the veins of the legs. This can cause the valves in the leg veins to weaken. 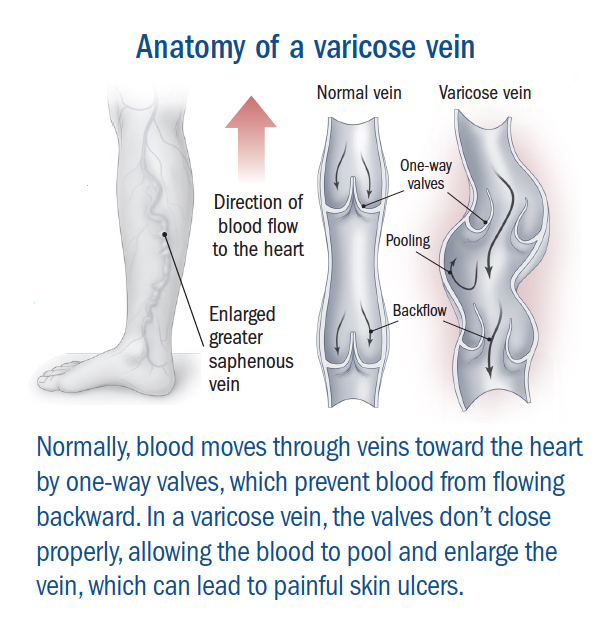 A tendency toward developing varicose veins can result from a genetic defect in the valves or in the wall of the vein. Damage to the valves from deep vein thrombosis can also lead to varicose veins. a feeling of heaviness in the affected leg that can get in the way of daily activity. Treating varicose veins generally begins with self-help measures. If these don't work, or don't work well enough, surgery many be an option. Elastic support stockings, which stretch from the ankle to just above the knee, compress leg veins and help push blood back toward the heart. These work best when they are put on first thing in the morning. Elevating your legs so your ankles are higher than your heart twice a day for 30 minutes can reduce leg swelling. Exercise is important in controlling varicose vein symptoms. The action of the calf and thigh muscles helps pump blood upward toward the heart. Swimming is an ideal activity since the pressure of the water can compress the veins the same way elastic stockings do. Losing weight, if needed, will also help relieve symptoms by reducing pressure on the legs. Wearing loose clothing, especially around the waist, upper thighs, and legs, can ease varicose veins. Tight clothes can make them worse. Wearing lower heeled shoes instead of high heels can help strengthen calf muscles, which can help blood move through the veins. People with varicose veins need to take care of their skin since it can easily become dry and itchy where it is stretched from swelling. Scratching can lead to sores or a skin infection. A good moisturizing skin cream, such as lanolin or hand cream, can help ease this problem. Several treatments are available to eliminate varicose veins. Sclerotherapy. This process treats varicose veins by injecting a liquid into the affected vein. The liquid irritates the lining of the blood vessel, causing it to swell and stick together. The vessel gradually turns into scar tissue that fades from view. Sclerotherapy is mainly a cosmetic procedure. Laser therapy. Shining light from a laser can make a vein fade away. Laser therapy works best on small varicose veins. Endovenous ablation. This is done by inserting into a varicose vein a device that emits a laser beam or radio waves. Energy from the device heats up the inside of the vein. This causes scar tissue to form, closing off the vessel. Vein stripping. For larger varicose veins that are causing serious symptoms, the best long-term treatment is surgical removal of the vein, a procedure known as vein stripping. Once the vein is removed, you should have relief from your symptoms. Since a varicose vein has already lost its ability to function, blood flow in the leg does not get worse when the affected vein is removed.